John Roberts-Lewis spoke on `British Colonial Money in Africa, to the end of the 19th Century'. A synopsis of this talk was published in the Club’s Newsletter Volume VIII, No. 9, January 2006 pages 49 to 51. Trading Companies, Figures 1 to 4. 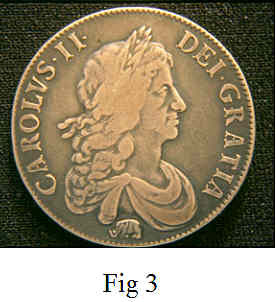 The right to have gold and silver coined in England was incorporated in the Charters of two of the Companies trading with Africa. 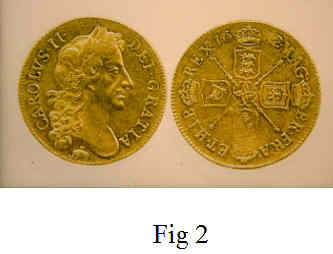 Fig.1 shows the obverses of gold 5 and 2 guinea pieces of Charles II, dated 1668 and 1664 respectively. They have an elephant under the bust denoting that the gold was supplied by ‘The Royal Adventurers to Africa.’ This Company was incorporated in 1662 and had an elephant as part of its badge. in 1672, but the elephant does appear with later dates occasionally. The practice continued until 1726. Primitive Money, Figures 5 to 8. 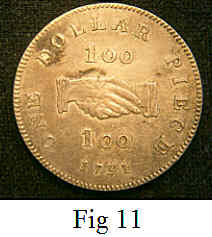 Numismatists use the term “primitive” for local currency either made locally or in the case of Cowrie shells imported. 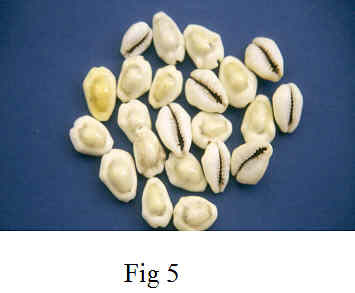 For much of the period of British control Cowrie shells, Figure 5, provided the means of making extremely low value payments. Far from being primitive, they are clean, impracticable to forge and by accepting only specific types of the shell from the Indian Ocean only devalue when too many are imported. 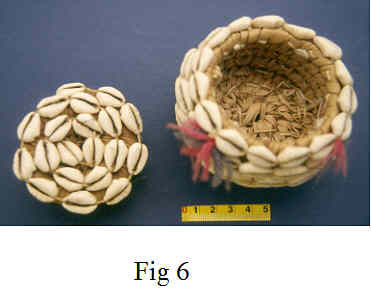 For monetary use they were strung and Figure 6 shows a decorative alternative when no longer accepted in payment. 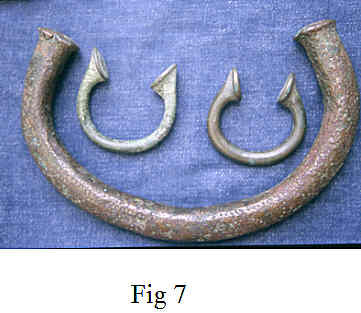 Figure 7 shows a large punch decorated copper bar known as Manilla used in Nigeria. The two smaller ones are European, probably from Birmingham. Their use ended near the end of the 19th Century due to excessive European imports. 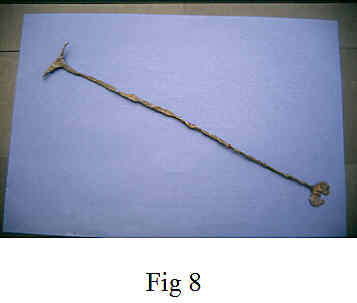 Figure 8 shows hand forged iron rods, twisted together and the ends flattened. 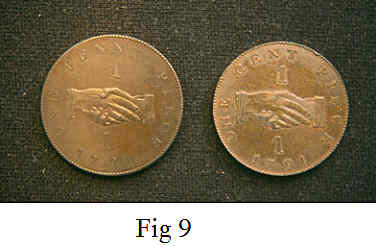 They circulated in Sierra Leone at twelve to the shilling and were known as ‘ Kisi Pennies’. Sierra Leone, Figures 9 to 14. 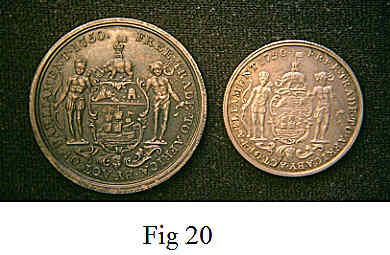 The first specific coinage for a British African territory began with copper pennies, Figure 9(left) and silver dated 1791. This was the date of the founding of “The Sierra Leone Company”. 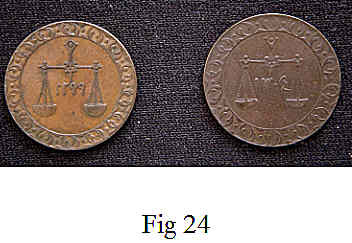 The coins were minted in 1792 and the pennies did not fit in with the silver dollar standard so they were replaced by 1 Cent coins, Figure 9(right). 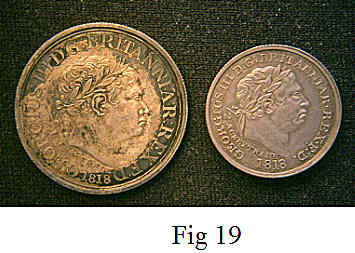 Figures 10 and 11 show the obverse and reverse of a redesigned dollar, struck in 1793, but still with the 1791 date. 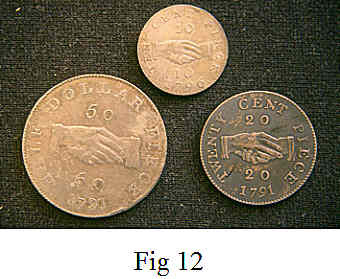 Figure 12 shows the reverses of the 10 cents, 20 cents, and 50 cents. 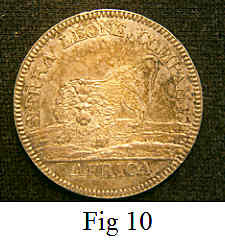 All have the lion obverse as shown on the dollar, Figure 10. 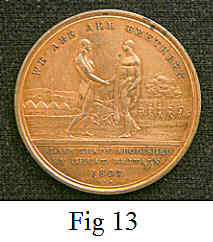 A copper piece, which used to be classified as an anti-slavery medal has no country name, the date is 1807, referring to abolition of the slave trade. 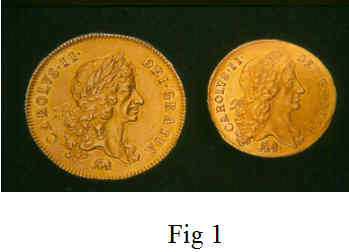 The obverse and reverse on Figures 13 and 14 show no monetary value, but the records of the Soho Mint have an order completed in 1814 for 50,000 pennies for Macaulay & Babington, for use in Sierra Leone. Gold Coast, Figures 15 to 20. 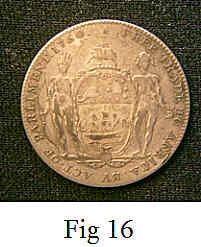 The first coins for the Gold Coast were struck for “The Company of Merchants Trading to Africa” which was created by Act of Parliament in 1750. 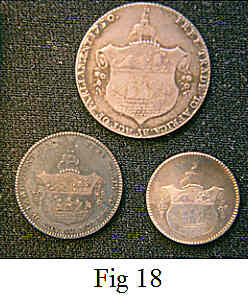 The silver one Ackey has a crowned cypher obverse Figure 15 and the Company badge and 1796 on the reverse Figure 16. 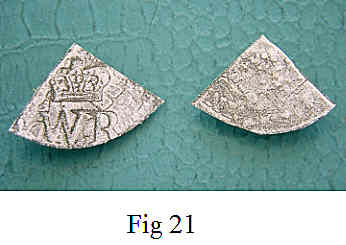 Figures 17 and 18 are the obverses and reverses of the minor silver consisting of the half and quarter Ackeys and the Takoe, the latter being one eighth of an Ackey. Both terms come from the gold trade. 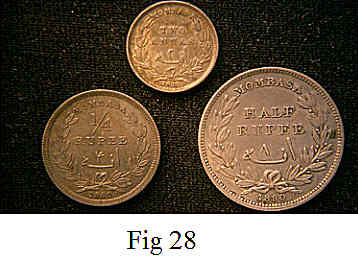 Countries of West Africa were generally short of coin and utilised any they could get. 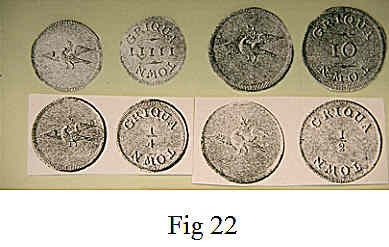 They also, as elsewhere, cut Spanish dollars, Figure 21, and countermarked them in an effort to prevent clipping and counterfeiting. These measures were not very effective and only when adequate supplies of British silver became available was this problem solved. 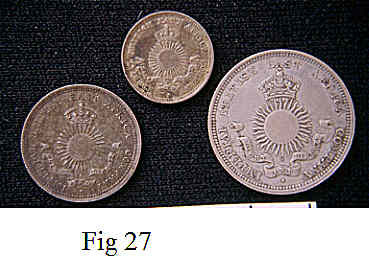 The London Missionary Society had coins struck for Griqua Town, but they were little used and soon withdrawn. 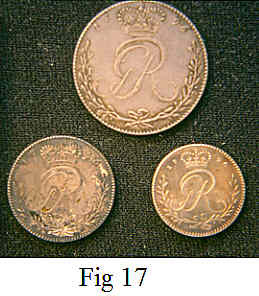 Extremely rare, they consisted of silver 10d and 5d and copper halfpenny and farthing. Figure 22 shows a photocopy with the Society’s flying Dove on the obverses and values on the reverses. Elsewhere in the south they used whatever came their way, including tokens. Eastern Africa, Figures 23 to 31. British involvement in the late 19th Century in East Africa included naval attempts to enforce the ban on slave trading. This included co-operation with Zanzibar through a treaty in 1873 and it became a British Protectorate in 1890. Figure 23 shows obverses of copper Pysas of Sultan Ibn Sa’id. Figure 24 has the dated reverses equivalent to 1882 and 1887. 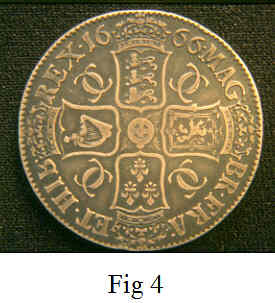 The coins were minted by Heaton in Birmingham. A Concession was obtained by “The British East Africa Association” in 1887, covering a large inland area and Mombassa plus some of the Coastline. 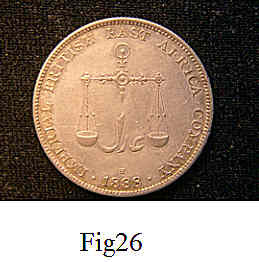 The Company issued coins; Figure 25 shows the silver Rupee obverse which uses the Company badge. 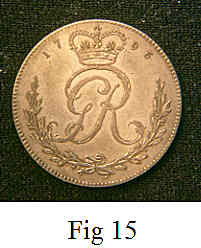 The reverse is dated 1888 with the Company’s name around the scales. 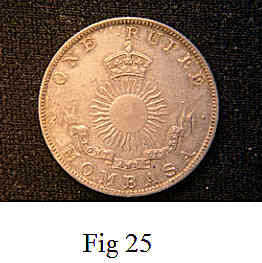 Figures 27 and 28 show obverses and reverses of the minor silver comprising half and quarter rupees and two annas. 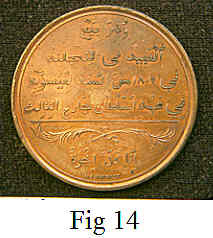 A copper Pice (quarter Anna) has obverse and reverse with English and Arabic inscriptions, Figure 29. 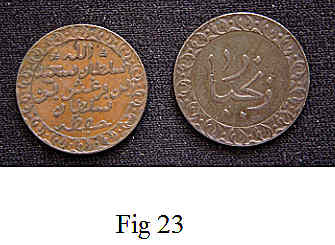 The Indian Rupee of sixteen Annas was the usual currency for Eastern Africa at this time. 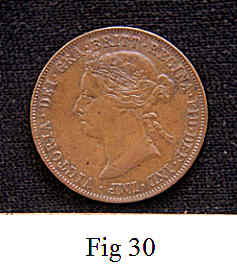 Finally Figures 30 and 31 show the only example of regal coinage for British Territories in Africa before the 20th Century. 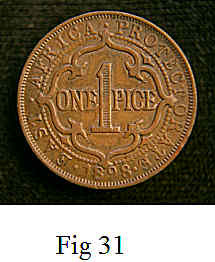 These one Pice coins were minted each year from 1897 to 1899. 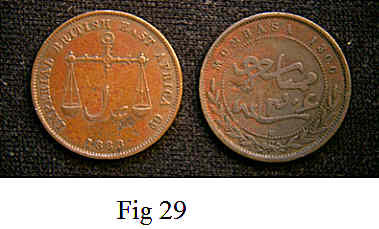 They circulated alongside Indian Rupee coinage into the 20th Century.